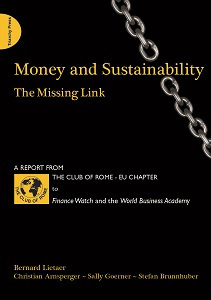 The inescapable and compelling conclusion of the new report from the Club of Rome - Money and Sustainability: The Missing Link - and what it unequivocally demonstrates is that a structural monetary flaw is generating the disconcerting array of problems we now have to address. This flaw is an unintentional defect in the very manner in which money is created. Greece has become the Achilles’ heel of Europe, and may force us to deal with this issue more urgently than most people expect. Our world faces unprecedented challenges including a two-fold sustainability crisis. On one hand, climate change, rising greenhouse gas emissions and spikes in food and energy prices signal that our ways of producing and consuming goods and services have become unsustainable. On the other, repeated financial and monetary crises remind us that our money system has its own problems. The ongoing eurozone crisis is only the latest in a long series. According to IMF data, between 1970 and 2010, 72 countries experienced a sovereign debt crisis (Greece is no. 73). In addition, there were 145 banking collapses and 208 monetary crashes. That makes a grand total of 425 systemic crises: an average of more than ten countries in crisis every year! The consequences in terms of unemployment, lost economic output, societal disruption and widespread human suffering are dramatic. In order to face the challenges of the 21st century, we need to rethink the very structure our monetary system. To date, well-intentioned efforts by environmentalists have tried to address the ecological crisis thinking up new monetary incentives, such as creating ‘green’ taxes or encouraging banks to finance sustainable investment. Economists, in turn, tend to believe the financial crisis can be ‘fixed’ and kept from recurring with better regulation and a strict, prolonged reduction in public spending. But, whether they are advocating greener taxes, leaner government budgets, greener euros or dollars or pounds, the report shows that both camps are merely putting a band-aid on a growing and aggressive cancer. Amplification of boom and bust cycles: Banks provide or withhold funding to the same sectors or countries at the same time, thus amplifying the business cycle towards boom or bust. Short-term thinking: ‘Discounted cash flow’ is standard practice in any investment evaluation. Since bank-debt money carries interest, the discounting of all future costs or incomes inevitably tends to lead to short-term thinking. Compulsory growth: The process of compound interest imposes exponential growth on the economy. Yet exponential growth is, by definition, unsustainable in a finite world. Concentration of wealth: This is another consequence of positive interest rates whereby the middle class is disappearing worldwide, with most of the wealth flowing to the top and increasing rates of poverty at the bottom. Such inequalities generate a broad range of social problems and are also detrimental to economic growth. Beyond the economic issue, the very survival of democracy may be at stake. Devaluation of social capital: This is built on mutual trust and leads to collaborative action. Though difficult to quantify, measurements reveal a tendency for social capital to be eroded, particularly in industrialised countries. Recent studies show how money tends to promote selfish and non-collaborative behaviours. In short, money is not value neutral. In the context of the Greek crisis, Deutsche Bank recently proposed for the first time a systemic solution, instead of the symptom alleviation approaches which have been the hallmark of the eurozone crisis until now. The “Geuro” would be a complementary currency circulating in parallel with the euro, activating and gradually restoring a competitive internal economy in Greece. The only missing piece in this “Geuro” proposal is the role of taxes. The systemic purpose of taxes is to give value to a currency that otherwise has no intrinsic value. That is true also for all fiat currencies including the euro today: it is the requirement by governments that taxes be paid in euros that creates the systemic demand for euros. We propose that cities or regions request contributions payable only in this complementary currency, which would generate a Keynesian stimulus, but from the bottom up, without creating additional debt. The Report from the Club of Rome – EU Chapter outlines eight other examples of innovative monetary or cooperative currency systems that can all work in parallel with conventional bank-debt money, and by their design can counterbalance the negative effects of the conventional system. Among the issues that these new systems address are healthcare, education, funding entrepreneurs, climate change, employment, cleaning up neighbourhoods, all without further burdening governments that are currently cash-strapped. New platforms for conducting commerce are now available through mobile phones, which are very cost effective and in which transactions can be made transparent to their users. In closing, it would be naïve to think of currency innovation as a magic bullet to solve all our problems. However, the report proves that rethinking our money is a necessary ingredient in any effective solution. We can no longer afford to overlook new currencies as the ‘Missing Link’ that can promote sustainability rather than undermining it at every turn.